Director/Screenplay – Stephen Sommers, Producers – Sean Daniel & James Jacks, Photography – Adrian Biddle, Music – Alan Silvestri, Visual Effects Supervisor – John Berton, Visual Effects/Animation – Industrial Light and Magic, Additional Visual Effects – The Computer Film Co (Supervisor – Mark Helm) & Digiscope (Supervisor – Brad Kuehn), Animation Supervisor – Daniel Jeanette, Special Effects Supervisor – Neil Courbould, Makeup/Creature Effects Supervisor – Nick Dudman, Production Design – Allan Cameron. Production Company – Alphaville/Universal. Rick O’Connell and Evelyn Carnahan are now married and have a young son Alex. They return from an expedition to Egypt with the Bracelet of Anubis. Fooling around, Alex puts the bracelet on and it displays a hologram showing the way to the Oasis of Ahm Shere, the tomb of the legendary Scorpion King. Alex then finds that he cannot remove the bracelet. The bracelet is sought by Egyptian cultists who succeed in raising Imhotep and then kidnap Alex to lead them to the oasis. 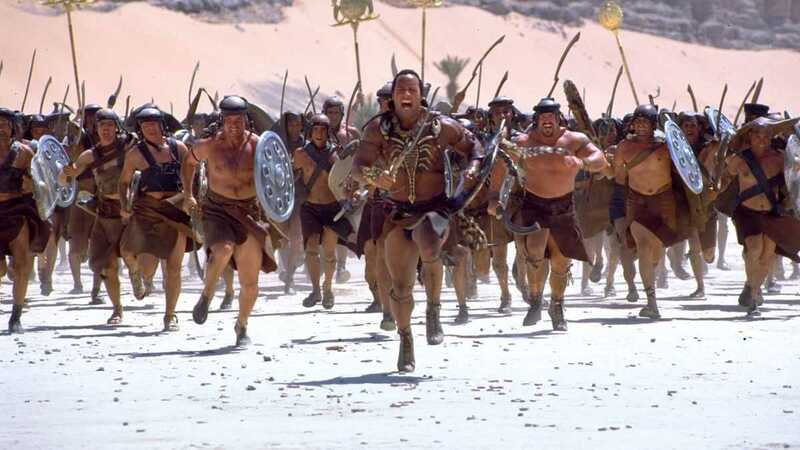 Rick and Evelyn return to Egypt in a race to stop Imhotep and rescue Alex. Stephen Sommers’ lavish, big-budget remake of The Mummy (1999) gave the creaky old revived mummy genre an updating by feeding it through the adventure spectacle of the Indiana Jones films, while reconstructing the creature by way of the modern CGI effects. The Mummy was not a particularly good film, with the spectacle and adventure being undercut by a comedic excess that clearly demonstrated nobody was taking the film seriously. However, it was a huge success, earning more than $400 million worldwide. Such successes invariably require sequels. The Mummy Returns is a textbook example of why it is such a good reason that most series should leave well enough alone the first time around. The Mummy Returns tries to outdo its predecessor by a factor of ten. It ends up as all spectacle to the extent that any intervening story between set-pieces has been trimmed to an absolute minimum. Stephen Sommers is relentlessly determined to bombard us with the spectacular at every point. Every frame of the film is filled with clashing armies stretching from horizon to horizon; gun, sword and fist fights in country mansions and the British Museum; an all-out chase with mummified golems in a double-decker bus; tides of scorpions; attack by mummies, golems and an army of animated shrunken heads; combat with a half-scorpion person; variously collapsing and flooding tombs; vortex whirlwinds of greenery; people hanging onto the edge of the abyss of the underworld. There is a repeat of the biplane fleeing from a sandstorm scene in the original with the company fleeing a wall of water raised by Imhotep in a balloon, which laughably develops afterburners and allows them to get away at the last second. The heroine improbably discovers a reincarnated past as a royal knife fighter, which then allows her to engage in dazzling sword duels and wall-bouncing acrobatics. The Mummy Returns is so determinedly in-your-face with its desire to be spectacular that it in fact becomes irritating – even something as simple as Brendan Fraser turning and bumping into his son at the start of the film or Rachel Weisz waving a torch in front of her are pumped up into monumental events by the soundtrack. What Stephen Sommers seems to fail to realise is that the perpetual bombardment with the impossible is something that contrarily produces no sense of wonder at all – The Mummy Returns operates barely above the level of pop-up menaces in a videogame. The Mummy Returns is possibly the perfect example of spectacle in a CGI film being produced for the mindless sake of it and unsupported by anything else. [Although, this is something that Stephen Sommers would manage to outdo in his subsequent film Van Helsing (2004)]. In order to pack all of this in, the script has to throw in a ridiculous number of lost cities, mystical artefacts and world-threatening villains. The way that each of the principal characters is given a predestined purpose reaches a point of laughable overkill – Rachel Weisz happens to discover she is a reincarnation of Nefertiti and an Ancient Egyptian fighting woman, and at the climax gets to routinely die and be revived; son Alex becomes the only one able to wield the crucial amulet that leads the way the oasis and will die if they do not reach there in a matter of days; the tattoo that Brendan Fraser got as a casual joke just happens to also reveal he is the saviour of the world; even the artefact that bumbling comic relief John Hannah carts the whole way through the film turns out to be a prophetically-ordained weapon during the climactic battle. At least the one thing all that the tedium-inducing overkill results in is a reduction of the comic relief from badly miscast goofball hero Brendan Fraser and the need for the awful Rachel Weisz to do any acting. The film does also introduce WWE wrestler The Rock (alias Dwayne Johnson) to the big screen. On tv, The Rock was a runaway sensation – he has the extraordinary ability to turn every movement he makes into a perfectly chiselled pose, not to mention a witty ability with stagemanship antics and in parodying his peers. However, his highly touted screen debut here was a disappointment. For one, The Rock is on screen for less than five minutes. His appearance has none of his small screen charisma and his acting is wooden. However, Universal and director Sommers were so impressed by his screen presence that they then spun him off as a film character of its own in The Scorpion King (2002) and Johnson, soon to drop The Rock sobriquet, managed to subsequently wield this into an A-list acting career. 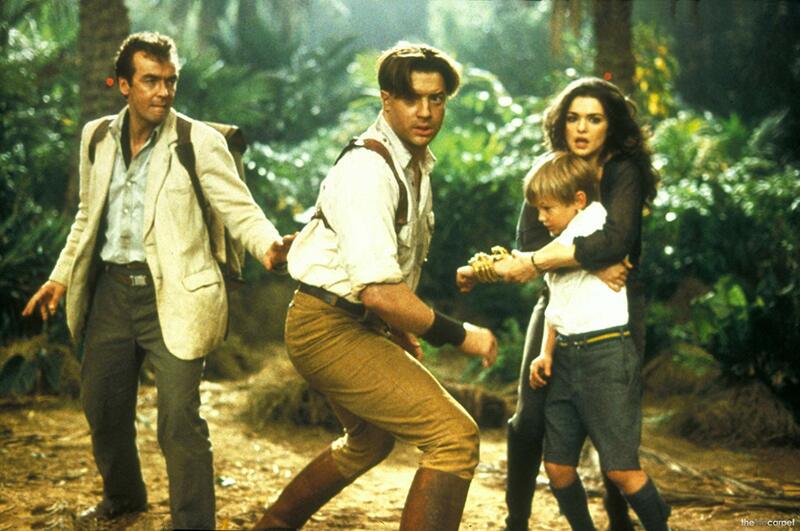 A third sequel was The Mummy: Tomb of the Dragon Emperor (2008), featuring Brendan Fraser again but without Rachel Weisz. Stephen Sommers stepped back to a producing position but the result was still drenched in CGI effects overkill. The Scorpion King also produced several sequels with The Scorpion King: Rise of a Warrior (2008), The Scorpion King 3: Battle for Redemption (2012), The Scorpion King 4: Quest for Power/The Scorpion King: The Lost Throne (2015) and Scorpion King: Book of Souls (2018), although none of these featured The Rock. Stephen Sommers’ other genre films include:- the live-action remake of The Jungle Book (1994), the monster movie Deep Rising (1998), the classic monster bash Van Helsing (2004), the action G.I. Joe: The Rise of the Cobra (2009) adapted from the popular toy line and the Dean R. Koontz adaptation Odd Thomas (2013). (Winner in this site’s Worst Films of 2001 list. No. 5 on the SF, Horror & Fantasy Box-Office Top 10 of 2001 list).